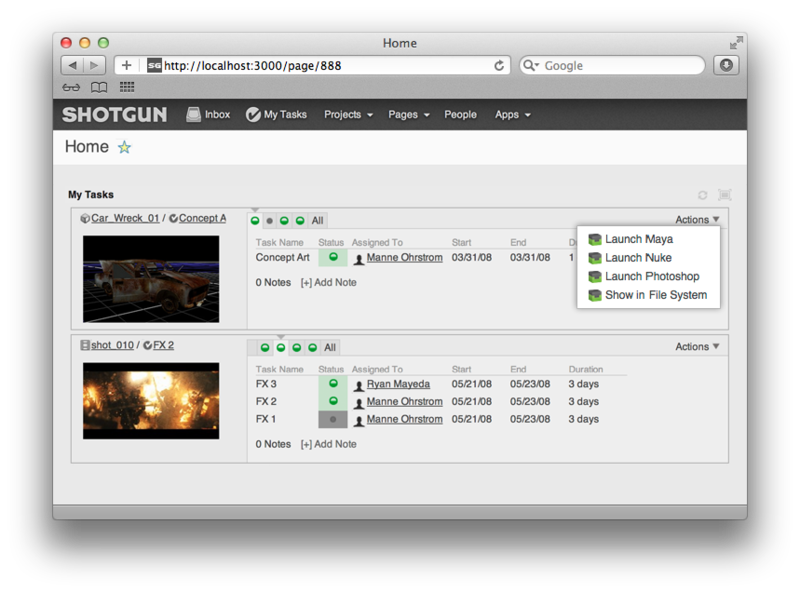 The Shotgun engine manages apps that can be launched from within Shotgun. Sometimes we refer to these Toolkit Apps as Actions. They typically appear as items on menus inside of Shotgun. When you click on an action, processing will immediately start. Once the app has completed, a message is typically displayed with some status information, or an error message if things didn't work. Developing apps that run inside of Shotgun is easy! If you are not familiar with how app development works in general, head over to the Platform documentation and read the introductory material over there. 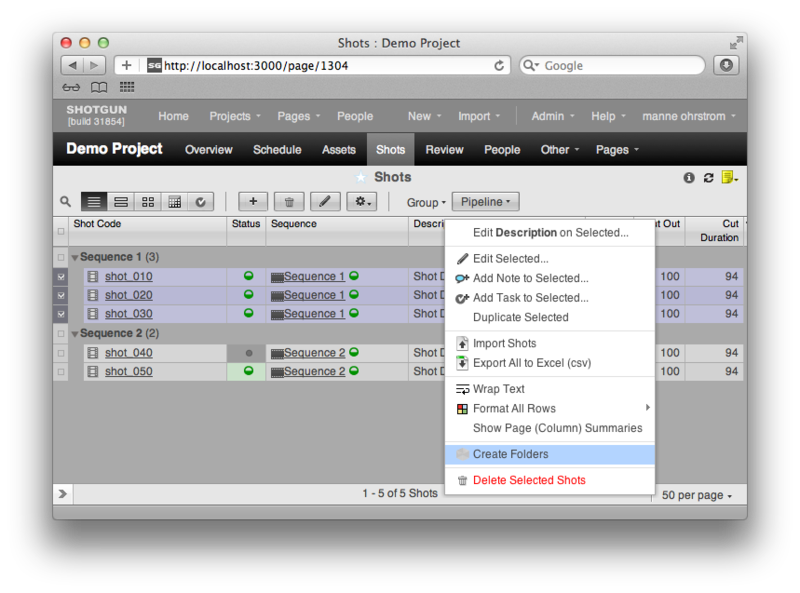 In this section we will just cover the Shotgun specific aspects of the app development process! You will need to manually install PySide or PyQt into your standard python environment if you want to execute QT based apps in the Shotgun Engine. It is possible in the Shotgun engine to make an action visible to a user depending on which permissions group they belong to. This is useful if you want example want to add a command to the Shotgun Action menu and you only want admins to see it. If you have access to the Shotgun Pipeline Toolkit, you also have access to the source code for all apps, engines and frameworks in Github where we store and manage them. Feel free to evolve these items; use them as a base for further independent development, make changes (and submit pull requests back to us!) or simply tinker with them to see how they have been built and how the toolkit works. You can access this code repository at https://github.com/shotgunsoftware/tk-shotgun. 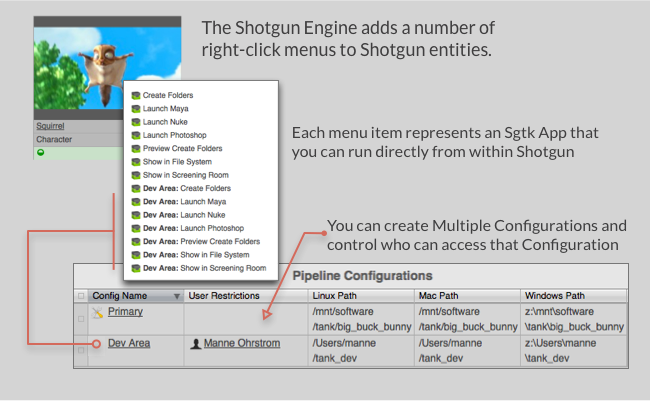 You need Shotgun Pipeline Toolkit Core API version v0.18.24 or higher to use this. Updated to require core 18.24 for QT5 compatibility. Adds back in Qt library path clearing, but only for KDE Linux. Removes the clearing of Qt library paths introduced in v0.5.3. This has been removed in favor of a safer and more-targeted implementation of the same in tk-multi-launchapp. Fixes crashes on multiple Linux distributions when QT_PLUGINS_PATH is set. This changes the meaning of the has_ui property so that it is consistent with other engines. Previously has_ui would return True as soon as a valid pyside/pyqt4 was detected. This is inconsistent with other engines, where has_ui indicates that an active UI is present and running. This pull request adjusts the shotgun engine so that has_ui only returns true when a QApplication is actually active in the system. Updated visual style to better match Maya. Details: This change affects the visual appearance of all apps running in the engine, making their visual appearance much more consistent with the look and feel that you would get inside Maya. Please note that after this upgrade, app UIs will look slightly different. Added support for multi-select style UI apps. Now uses the built in QT stylesheet introduced in Core v0.14.28. Updated QT Style Sheet to include a border around text input elements. Fixed a bug where debug logging was supressed from the output despite the debug flag being set. tank can load PyQt4 from the python system path, it will attempt to use it. This is a fallback in case PySide is not found. * Better error messages when PySide/PyQt4 is not installed - the engine now presents some more polished feedback in the case a UI based app is launched but neither PySide nor PyQt exists to handle the UI creation. Fixed a bug which could cause apps raising Exceptions to be stuck in a loop. Fixed formatting bugs related to html characters and certain exceptions being raised. Bug 19097: < and > Characters are now html escaped and no longer swallowed in the output.